Search our finding aids for processed manuscript collections. A University at Buffalo Libraries Special Collection, the Poetry Collection is the library of record for 20th- and 21st-century poetry in English. Founded in 1937 by Charles Abbott, the Poetry Collection now holds one of the world’s largest collections of poetry first editions and other titles, little literary magazines, broadsides and anthologies; a substantial collection of artworks; and more than 150 archives and manuscript collections from a wide range of poets, presses, magazines and organizations. 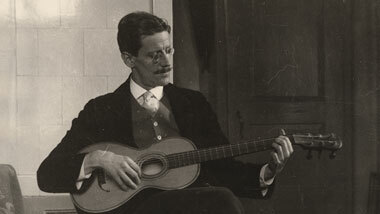 The James Joyce Collection. Comprising of more than 10,000 pages of the author’s working papers, notebooks, manuscripts, photographs, correspondence, portraits, publishing records, important memorabilia and ephemeral material, as well as Joyce’s private library and the complete body of significant Joyce criticism.